I’d like to place a passcode over the WhatsApp iOS app. So that when the app is opened, it does not launch right away, but rather asks for passcode verification first. Go to Settings→Screen Time→App Limits→Add Limit→Social Networking. Add a one minute limit, then all consecutive launches will require passcode entry in order to permit access to the app. Alternatively, in February of 2019, WhatsApp updated their iOS application to support exactly this feature. To enable, go to WhatsApp Settings→Privacy→Screen Lock. This supports Touch ID and Face ID. Neither iOS nor WhatsApp have any built-in feature for passcode protection. 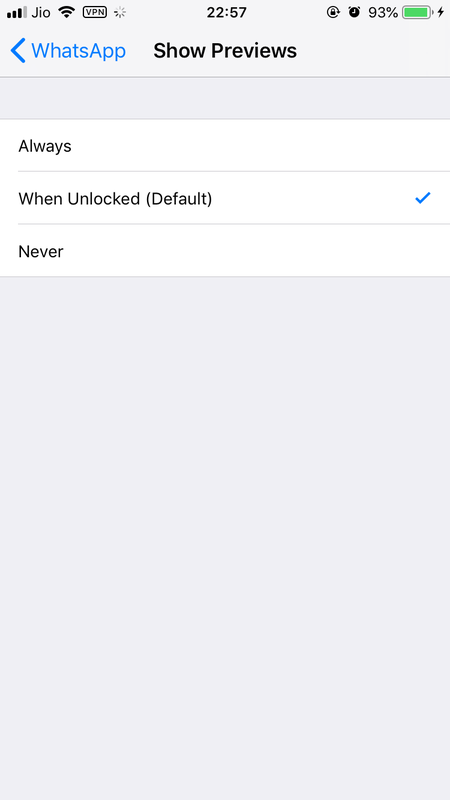 The best you can do to protect access to your WhatsApp data is to set the lock screen passcode and--depending on the model of your iPhone--setup Touch ID/Face ID to restrict access to your device. Starting with iOS 11, you can also choose to hide the WhatsApp notification content when shown on the lock screen to guard against exposing sensitive communication to unintended users. To hide display of notification content, on your iPhone go to Settings app → Notifications → WhatsApp → Show Previews and select Never. Not the answer you're looking for? Browse other questions tagged applications password unlock . Is MacKeeper a contoversial App that new Apple Users should be educated to stay away from? How can I password-protect an app folder in iOS?